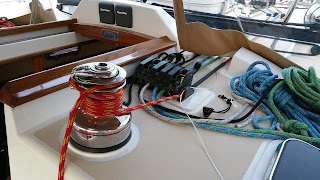 Argon is equipped with Spinlock XTS rope clutches for the halyards, and various other control lines brought to the cockpit. I used to think that was a good thing but I've since changed my mind about that. The Main Halyard in particular has been really abused by the spinlock. They work by basically crushing the line between a cam and a flat surface so a lot of crushing force gets applied to just one point on the line. Our poor old main halyard was getting "lumpy" from this abuse and we decided to replace it this spring when we had the mast down. So Hall Spars made us a nice new 10mm Halyard. We quickly realized that this one was going to get just as beat up as the last one. In fact, the new one is slightly thinner than the old one and so it would slip even more in the spinlock. 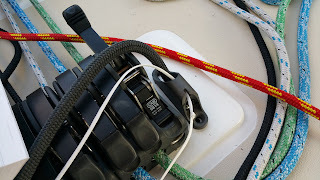 Another issue with this new halyard is that instead of putting a simple twist-lock shackle on the end like the old one, they put a shackle with a "captive" screw pin. Yes I meant to put "captive" in "quotes". This is a pain for us because we always undo the halyard when we're not sailing. 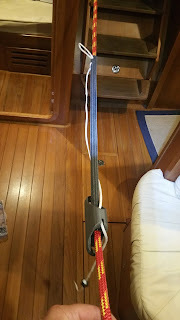 It makes attaching and detaching it much more difficult and as we found out in Nova Scotia one day, VERY difficult if the boat is bouncing around in waves at the time. We replaced the new shackle provided by Hall Spars with our original shackle from the old halyard. The original shackle has a much more convenient and secure pin. We were heading from Lunenberg, NS down toward Cape Sable in some very big seas. I went up on deck to get the main sail ready to hoist. The boat was all over the place in these waves and I was doing all I could do to hang on AND mess with screwing this shackle onto the mainsail. Then, the expected happened: The halyard slipped out of my hand and was flinging around all over the place as the boat bounced around! I finally got hold of it again and after feeding it back through the lazyjack lines, I noticed - oh no - the "captive" (with quotes) pin was gone! I said some very bad words at this moment. Then I looked down at my feet and - can you believe it? - it was sitting right there on the deck! How? 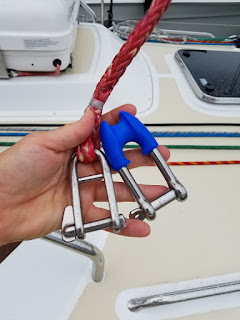 We apparently got the sail hoisted (as proven by the fact that I'm writing this from Boston), but one project for sure would be to transfer the nice Wichard quick locking shackle from the old halyard to the new one. The new shackle with "captive" pin is now in our spares kit. So what about the rope clutches? Before we left for Nova Scotia, I did some research and found Ronstan Constrictor Textile Rope Clutches. These work like the Chinese finger trap you used to play with when you were a kid. The line you want to clutch goes through a long textile sleeve. As the line loads up, the sleeve constricts applying gentle pressure over a long section of line instead of a crushing pressure from a cam at just one point. I ordered a 10mm one. It arrived before we left but I didn't have time to work on it before departing. Playing with the constrictor the night before installation. The halyard is run through it and it seems to fit properly. Note the white lanyard - that's the release line. You give that a little tug and it retracts the sleeve and lets the line pass through again. There is also a bungee that is supposed to apply some "pull" on the sleeve to keep it constricting. When you pull the retraction lanyard, it's supposed to work against that. Could such a simple thing really work? Today, I went for it. I removed the headliner in the aft cabin so I could see the holes drilled and tapped into the backing plate. This is not the first time I've drilled and tapped holes in the clutch backing plates. Last year, I added another dual Spinlock to the port side for the Spinnaker Tack Line. Holes drilled and backing plate tapped 5/16-18 thread. Constrictor set in place. Notice the small footprint compared to the spinlock. The mounting hole spacing is the same so the mounting is just as strong. A little Life Caulk Bedding Compound and the thing was mounted. Fortunately there was a light south-ish wind tonight so I hoisted the main using the electric winch as usual. Nothing unusual to report so far. It went up just fine. A few times along the way, I would lower it a bit to see what would happen. 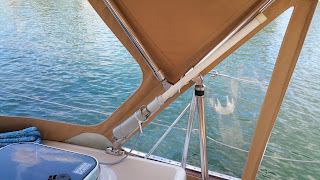 If I didn't retract the sleeve, it would drop a few inches and then grip the halyard perfectly. Finally I hoisted it all the way. When it's up, this line is REALLY loaded up. Notice the four winds on the clutch. You won't get the sail up with fewer than that. At this point, I did NOT have the bungee mounted and rigged up. So I manually slid my hand down the sleeve to "pre-snug" it a little. Sail is hoisted. Load is still on the winch. The sleeve has been pre-snugged by hand. I removed the line from the winch and... well to say it didn't slip at all would be a bit of an exaggeration. But it did only slip about 1/4 inch and then held the halyard perfectly. 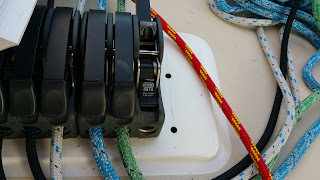 This is a huge improvement over the spinlock which would sometimes slip 3 or 4 inches until the cam squeezed the life out of the line at just one point. I am a fan. As for that Bungee, I've decided not to mess with it. Without it, the constrictor still constricts as long as it's not retracted. In its natural state, it will slip maybe 4 or 5 inches before it grips it enough. To really lock it in place, it's simple to just run your hand down the sleeve and snug it. And the sleeve holds! So, now we have a nice new halyard that can be fastened to the sail easily, will not be crushed by a clutch and will keep the sail up! And, it's a pretty red color. I worked most of the time during this three week trip in Nova Scotia and Maine taking only three days of vacation for the offshore legs. So I needed constant connectivity. 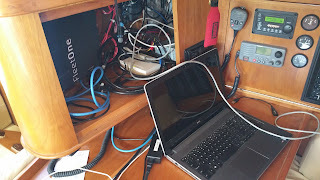 About two weeks into the trip, the Bullet Wifi Radio/Router stopped responding. Well Snap! this is a problem - and don't even ask how much we spent on data during this trip. I limped along for a few days on expensive 4G data but when we finally got to a slip at Dimillo's in Portland, ME, I decided to work on it a bit. I was able to climb up on the stern rail and just reach the Bullet. After retrieving it, I wired it in directly to the router at the nav station and... it works! So the problem was most likely the disconnect at the base of the radar mast. This is not the first time this has failed. The Bullet's temporary mounting for the rest of the trip. I searched around and found what looks like a very nice weather/waterproof RJ-45 Coupler. I ordered it so that it would be waiting for us when we returned home. 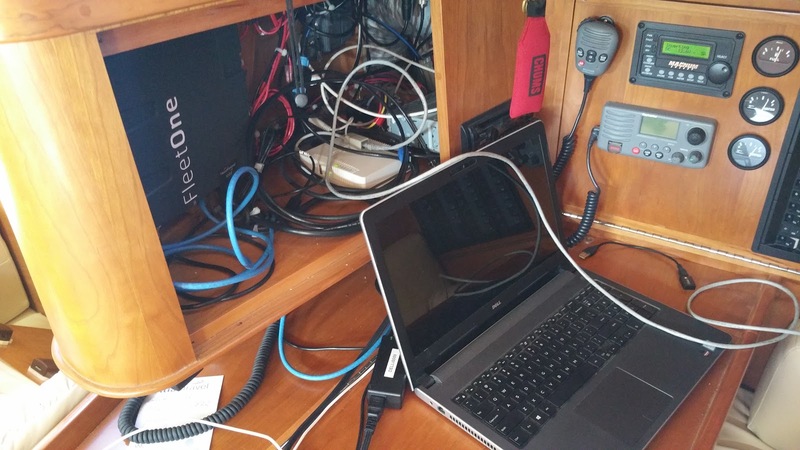 There comes a time in every boat's life when something goes wrong with the sanitation system. In this case, our macerator pump had been ceasing up repeatedly and more recently just plain failed to pump. This pump is used to empty our holding tank overboard and can only be operated when outside of the 3nm "no-discharge" zone. Without it working, and without any available pumpouts, we were starting to get a pretty full tank. I begged Linda to let me take on this job, but she insisted. I won't know until next time we're 3 miles offshore. Dear Marine Industry: Can we come to an understanding? Can we either have "marine" prices and get excellent quality and service, or can we get cheap prices and continue to get the crap we get today? I'm beginning to lose my patience with the "marine" prices for crap quality. In Mackerel Cove, ME, we started the process of dropping our anchor for the night. The anchor grabbed nicely and we were almost done. 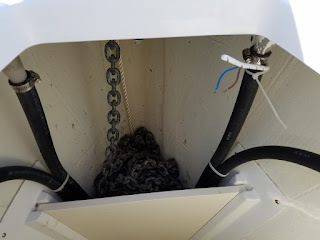 I wanted to take up a few feet of chain to attach our snubber after which I would let those few feet back out. I pressed the "Up" button. It came up. I released the Up button. It KEPT COMING UP, and up... and up and up. Eventually the clutch started slipping (good) and the breaker blew (good). I want to point out that this is a Quick brand Windlass with very little use - just saying. So much for my relaxing night after work. I had a "project". Yay. After disassembling the switch, I found that under all that rubber pushbutton stuff, is a cheesy little 75 cent microswitch. Yes, really. The control for your Windlass (did I mention it was a Quick Brand Windlass? 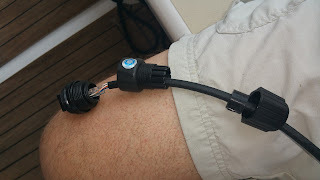 ), up there on the foredeck where it is covered in salt water and mud and sand, is a $0.75 plastic switch. Ugh. For the rest of the trip, our "up" button consisted of shorting out two wires which used to be connected to this failed switch. We also learned that you should ALWAYS leave your windlass breaker OFF when not operating it. Could you imagine the fun if this switch failed like this in the middle of the night and lifted the anchor off the bottom? The new UP switch for our Windlass. Just short those two wires together. Reminds me of when I used to steal cars. I'm still not sure what I'm doing about this yet, but it sure the hell isn't going to be to replace the switch as-is. I think we will be building something from scratch with some real switches and filling the existing switch holes in the deck with epoxy. And just to help keep awake at night... our Bow-Thruster is also Quick Brand. Astute readers may remember that we had a bit of excitement during our first night offshore three weeks ago en route to Nova Scotia. We ended up losing control of the jib sheets in high winds and for a few minutes, the jib was beating the crap out of itself. 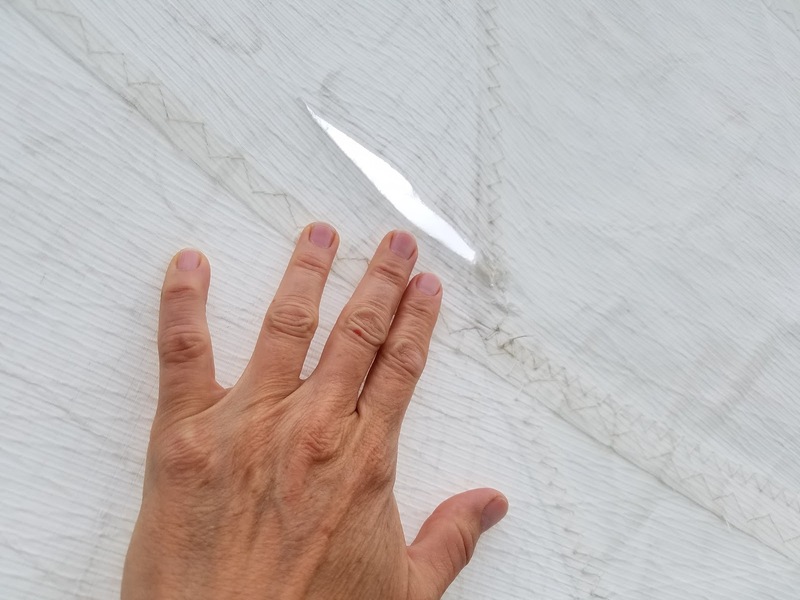 Apparently, the metal clewboard of the sail slapped the sail such that it put a nice slice in it. The clewboard is a pretty heavy metal thingie with some sharp-ish edges so I'm not surprised. Clean slice in the jib from the clewboard, luckily not along a stress line. We taped it up in Lunenburg temporarily but then did a more permanent fix when back in Boston. 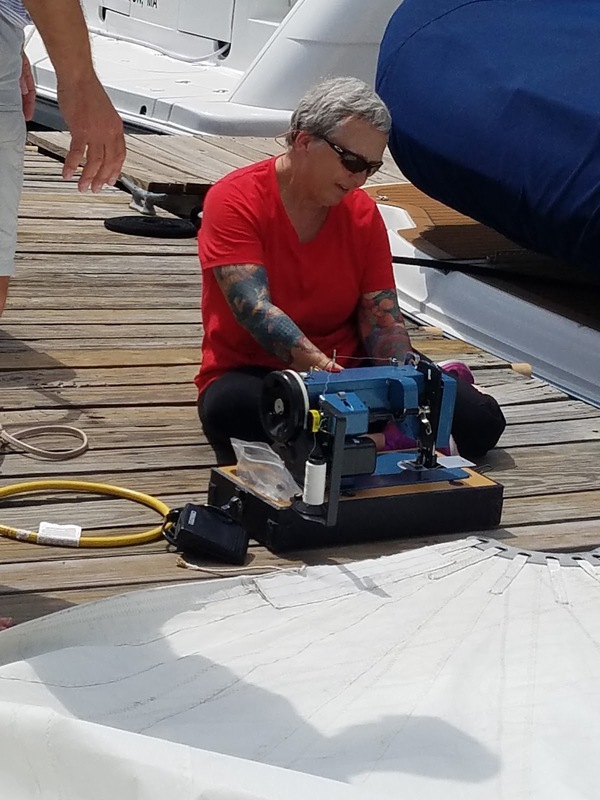 Our good friend Yolande from team Prairie Gold just happens to have one of those fancy Sailrite Sewing machines. We applied sail tape to both sides of the rip, and Yolande stitched it in for extra strength. Will this get us through the next year? Maybe. Dockside service on one of those 90+ degree afternoons recently. Thank you Yolande!! Fresh piece of dacron sail tape sewn on for good measure. The culprit clewboard is to the right of Yolande. Now time to get this jib back on the forestay. Before we left for Nova Scotia, we noticed that there was some black dust from the alternator belt on the engine. The belt still looked fine but we knew its days were numbered. 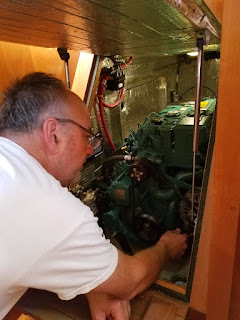 After a particularly long day of motoring from Southwest Harbor, ME to Small Harbor, ME (Casco Bay), we noticed that the belt was audibly squeaking a bit when the engine was first started. So before we set off from Small Harbor to Portland, we decided to change it. This is fairly easy to do and we of course had a spare. We have since ordered TWO spares to keep on-hand. Checking/tweaking tension on the alternator belt. I've been trying to plot a nice Compass Deviation Table. I wrote about it a while back if you're interested in such things. I noticed in some recent readings that there were pretty big differences between the port and starboard wheel compasses. I had a hunch. Could it be because of the speaker in my guitar amp which happens to be stowed in the aft cabin directly under the starboard wheel? Why yes it could! We had to remove everything from the aft cabin anyway to get the floorboards up in order to gain access to our spare macerator pump. 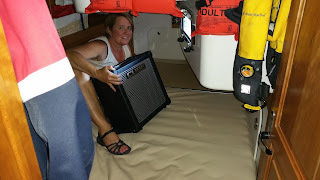 So while it was empty, I asked Linda to move the amp around and try different orientations. I went up in the cockpit and watched the starboard compass swing 10 degrees! This is about as close to having a roadie as I'll ever have. Anyway, we have now moved the amp more forward and face down. The effect on the compass seems minimal at most. And, to get in some more sailing! Was serendipitous and nice to meet Linda at Constitution Marina last week. We enjoyed our stay there with the Tartan Group. You have a nice boat as viewed from slip E26. I agree 100% with you about the pervasive problem of inferior quality parts and materials at high prices for boat products. 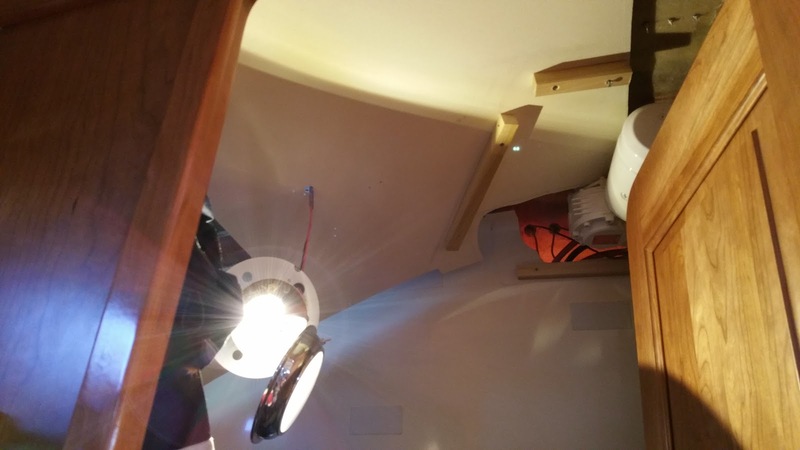 As for the main halyard, we had a bear of a time raising our main with the factory installed sail track on our 3700. We had the Harken Batt Car system installed and that made a world of difference. We've had no problems with our spin lock cleating. All our lines are original on our 2005 T3700. 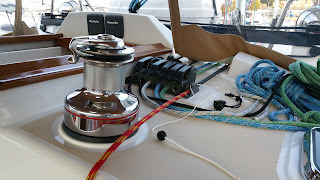 We had problems right away with the down switch on our Windlass, a Lewmar. Fortunately, there was a manual override available that works fine in an emergency. I keep that handy for emergency. 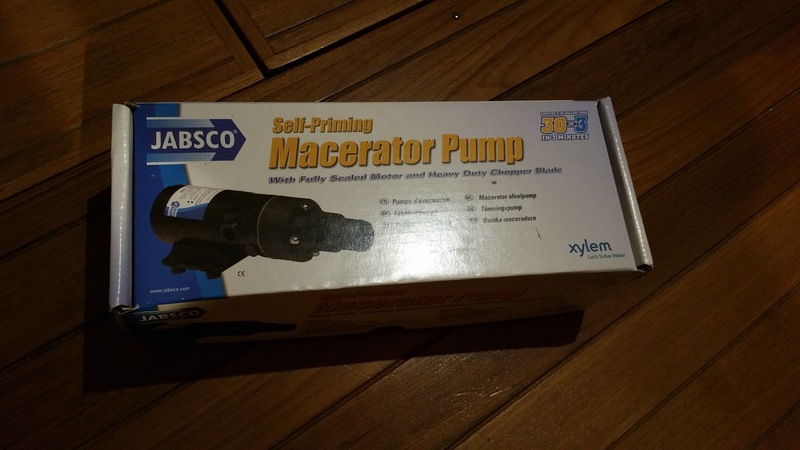 So far our macerator pump, ( 12 years old) has worked fine, but we don't use it a lot.